IMPORTANT - THIS GUIDE IS ONLY FOR FRESH STORE BUILDER CUSTOMERS. If you have a Fresh Store Instant package, you get over 300+ different 10SS to install directly from your FSI account area. This guide will walk you through how to use the 10 Second Stores feature to quickly import and setup your store. PLEASE NOTE: YOU MUST HAVE FRESH STORE BUILDER INSTALLED BEFORE USING THE 10 SECOND STORES. Important: If you have 10 Second Stores from the Version 7 Launch (Jan ’16), your store will need to be set to USA (Amazon.com). We plan to add more for other locales in future. Once you have your store installed and your Amazon Keys entered – you can proceed with the remainder of this guide. Once you login to your site via your Freshadmin login url, you will see the 10 Second Stores link on the Top Menu. Click on the UPLOAD button in order to select the STORES.ZIP file you received. IMPORTANT NOTE: Depending on when you received your 10 Second Stores bonus, the zip file you received might be called something other than “stores.zip” – for example it might be called “10ss_50_20160106_v7launch.zip”. Simply navigate and select the file you were given. 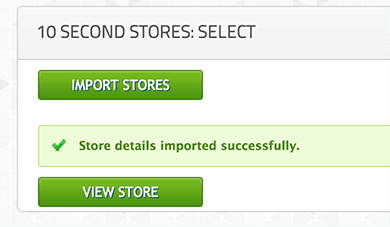 Importing one of the 10 Second Stores will remove any products, categories, widgets and options previously set. Make sure you want to proceed and then click on the CONFIRM button.